About halfway between Cannes and St.-Tropez, but not getting near the attention, are the twin cities of Frejus and St.-Raphael and immediately to their south is the spectacular shore road along the Massif de l’Esterel – the Corniche d’Or. These are not key destination points in Cote d’Azur, but are well worth a visit. Frejus is of particular interest for history buffs as it is far more than just another part of southern France’s Roman history. It, along with Arles, was one of the major beneficiaries of Massalia’s (Marseille) decline after it backed Pompey over Julius Caesar in 55 BC. As a result of that decision, Arles was the new “first city” of the broader region, and Frejus became Julius Caesar’s regional naval base. In 31 BC, Octavian, later to be called Augustus, brought to Frejus the fleet he captured from Mark Anthony and Cleopatra at the Battle of Actium. In addition to being an important Roman naval base, as the first seaport coming east on the Aurelian Way, Frejus was a primary shipping outlet for wines, olive oil and other agricultural products flowing in from flatter land north of the mountains to west. For a time, Frejus may have been the second largest Roman port after Ostia, which was right outside of Rome. The importance of Frejus was accompanied by the building of some of the earliest Roman civic structures in France. 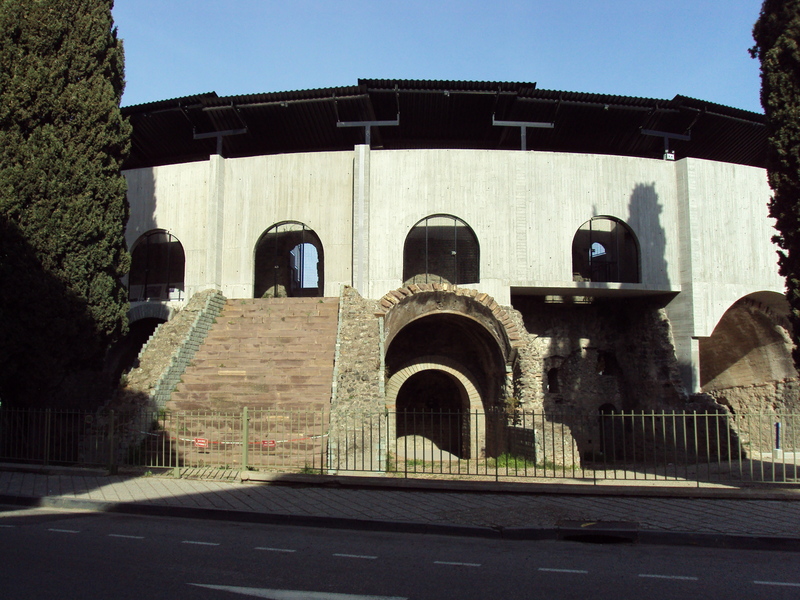 The Frejus arena dates back to the early 1st century and is the oldest surviving arena in France. Parts of its theater of the same era are also still visible. In addition, there are the remains of several pillars of a 20 mile long aqueduct; portions of a theater; two gates – La Porte d’Oree and Porte des Gauls; a tower signifying the entrance to the harbor, Augustus’ Lantern; and Roman ramparts. Frejus also has a medieval gothic church, Cathedral St.-Leonce, built over a 5th century Roman era baptistery. It takes a little looking to find some of these Roman sites, but not being a big city, it is easy to get around Frejus, and there is ample on-street parking. The recently refurbished arena and gothic church are easy to find in the center of town, and the church with its tower can be seen from a distance. 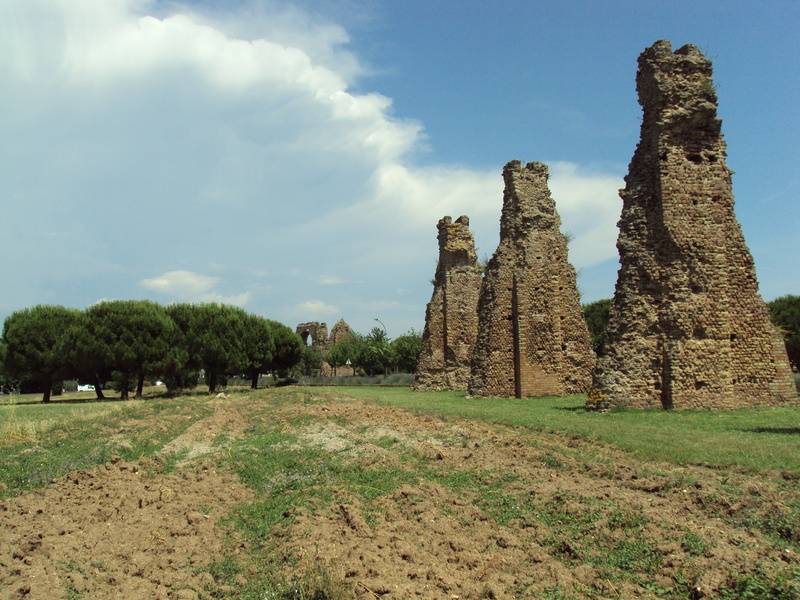 The most interesting of the Roman ruins, the stanchions of the aqueduct, of which there are many located in close proximity, are east of the town center. This aqueduct carried water to Frejus from the hills several miles away. After the fall of the Roman Empire, the once booming port of Frejus gave way to the non-navigable swamplands that had been there before the Roman reclamation. Credible population data is not readily available for those days, but in the 1st century, the arena supposedly seated 10,000 people. Even if that is a bit of stretch, it suggests a population that could have been as much 20,000, but by the end of the 12th century, its population was reportedly down to about 1,500. Today, Frejus is a city of about 50,000 residents that is virtually indistinguishable from the more fashionable, neighboring city of St.-Raphael with another 30,000 people. St.-Raphael also dates back to Roman times, but without the Roman ruins. Its main sight, besides the attractive downtown on the shore road downtown is its 12th century church, St. Rafeu, and its accompanying medieval tower a couple of blocks in from the shore road. There are numerous good eating places in Old Town Frejus and in the more modern St.-Raphael downtown. Even if Roman ruins are not your thing, taking the shore road instead of Peage 8 at least one way on a trip from Nice or Cannes to St.-Tropez is well worthwhile just to drive along the Corniche d’Or that goes right through the red rocks of the Massif de l’Esterel. For several miles the rocks come out to the sea creating spectacular scenery. A friend visiting us told me that this ride was the most interesting, and surprising thing he saw in all of Cote d’Azur. This entry was posted in Corsica, Frejus, St.-Raphael and tagged cote d'azur, france, Frejus, french riviera, South of France, St.-Raphael. Bookmark the permalink.